What? From the show website: ""
What? 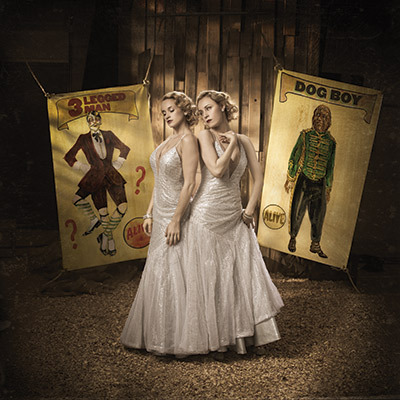 From the show website: "Step right up to this thrilling reimagining of Side Show, the acclaimed 1997 Broadway musical inspired by the true life story of conjoined twins Daisy and Violet Hilton. Developed in association with the La Jolla Playhouse, this production features new songs as well as new characters. Chronicling their rise from freak circus attractions to famous vaudeville entertainers during the Great Depression, Side Show follows the Hilton sisters' heartwarming search for love and normalcy amidst the spectacle of fame and scrutiny of the spotlight. Featuring music by Henry Krieger and book and lyrics by Bill Russell, the original production of Side Show went on to earn four Tony Award nominations including Best Musical, Best Book, and Best Original Score. Directed by Academy Award winner Bill Condon (Chicago, Dreamgirls, the final two Twilight films), this exciting new staging of Side Show joins a long roster of celebrated Kennedy Center musical revivals that include Ragtime (2009) and Follies (2011).."